Pasting Scorebridge Results so that Links and Table borders show. Chrome doesn't display table borders; IE does. Use Chrome to pick up the web page produced by Scorebridge; use Firefox to save on the ABU Web site. The resulting web page is up to the original high standard provided by Scorebridge and is a joy to view, especially if the background colour (selected in Scorebridge under web page Preferences) is white. Additionally, the links to Travellers and personal Scorecards are fully functional. A bit of a faff, but well done, Henry, for finding a solution. This is done using Windows Select, Copy, and Paste to copy text from 1 area to another. Use your Scoring Program, (Scorebridge, Jeff Smith's Scorer, Whatever), to create the results for your clubs. With the results page open, position the mouse anywhere in the results page, and left-click the mouse. Select all (Ctrl-A) - the information is highlighted in blue. Copy (Ctrl-C) - the information is saved in the buffer. Go to the ABU Website, and Login. Click on 'Submit an Article. The article submission form opens. Position the cursor in the edit (content) window, and left-click the mouse. Paste (Ctrl-V) - the results from the buffer are pasted to the edit window. The Web page editor window has tabs: Content, Publishing, Language, Metadata. Category is selected under Publishing. If you have access to more than 1 category, then the default category will be the lowest, alphabetically. If Save without setting the correct Category, simply open the article, Edit, Select the Publishing tab, Set the correct Category from the dropdown, and Save. No need to create a new article. Under Members, click 'Forgot your Password', then enter your email address when asked to do so. Tell the system you're not a robot. The system will send you a new password. Login, using your SBU number as Username, and the System generated Password. Under Members, click on Edit my Profile; set new password; Save Profile. 3. Click on the Article Title. -. The article opens for Editing. 7. Click 'Save' - the article is saved. - if you navigate to <club>results it is no longer listed. A link to a PDF file can be included in an article, in a circuitous way, by pretending to include an Image in the article. 2. Create / Edit an article. - a list of images for Newton Stewart is shown (there may be no images for your club). 5. At the bottom of the pop-up, there is an option to upload a file; click Browse to find a file on your PC to upload. 7. If successfully uploaded a message will appear: "Successfully uploaded clubs/newtonstewart/myfile.pdf"
8. Click Cancel to return to the Edit window. 10. Select the text 'Hand Records', and then click, above the Edit Window, the Link icon ( a chain link). 12. Click OK, to save the link. 13. Click Save to save the article. 14. When the article is saved, check that the link works correctly by clicking the text where you created the link. there really isn't a need anymore to have a PDF hand record. To insert a link in an article to either another article on the ABU web site, or to an external web site, do the following. 3. 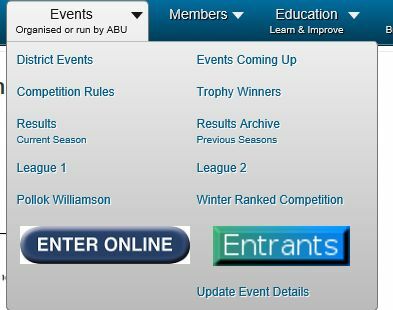 Log in to the ABU Web site. 4. Open the article in which the link is to be placed for editing. 5. 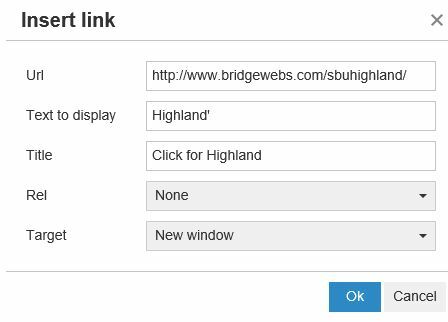 Type in some text, 'Highland' and/or select the text from which you wish to link to the other page. 6. Click the Link icon. New events are added by the administrator. e.g. Date, Time, Cost, Convener, email of the convener. (email of Convener is used to send a notification email to the convener when someone enters for the event. The start time of the event is entered separately from the Event Date. If time doesn't change, no need to change it. Ensure no other User logged in. Enter the xadmin password (Hint: a telephone no., but with “0” as “o”, “1” as ”i”, and 5 as “s”. Scorebridge closes and the update is performed. A pop-up appears showing the version of Scorebridge installed. Record the activity in the log book. Inform clubs with a message on the noticeboard. The Scorebridge Support licence expires on 19 Jun. If the ABU intends to continue using Scorebridge to score events, it should be renewed by the treasurer, and the new Support key installed on the date notified by Scorebridge. Scorebridge is licensed to “Ayrshire District”. A PDF document has been written giving an abridged introduction to using the Dealer4+ machine. Check the SBU web site for more up to date versions. 10) Check your details are correct.